Today we headed out to lunch after a lazy morning of opening more Christmas gifts. We dropped Daddy off at work and headed to Seventh Street Pizza in Capitol Hill. Unlike yesterday, Lucy did a great job eating her lunch and entertaining the little boy next to us. After lunch, we hopped into “the ice cream shop” Pitango to split a treat. It took much convincing that we were getting a cup instead of a cone. 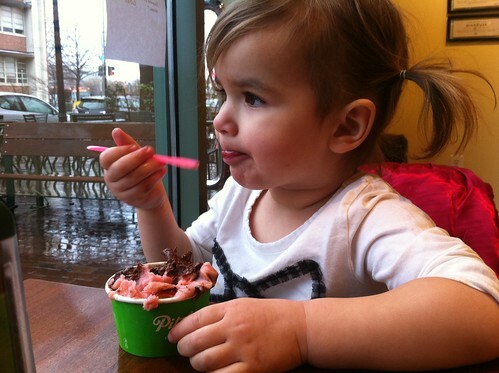 But Lucy was pleased once we settled down with two spoons in our hands. Amelia is wearing that same shirt today! We miss you, and your post makes me miss DC.